Today, early in the morning, Pravisan, Kushal and I, three ELI Africa volunteers, set for Mahebourg where we had to collect Mangrove propagules for the mangrove planting event which will be held tomorrow, Friday 24th of April 2014, at Grand River South East. It was around ten in the morning when we reached the designated area. The sun was already shining above the horizon while we were on our way to make a difference in our community. Paving our way through the slope of the area leading to the spot where the propagules were, we were amazed to find the condition in which the plants grow. The propagules would grow roots even if they are merely stuck in the swamp and unknowingly they would contribute towards the conservation of our beaches and our marine ecosystem. After having inspected the area, we started the collection of propagules. 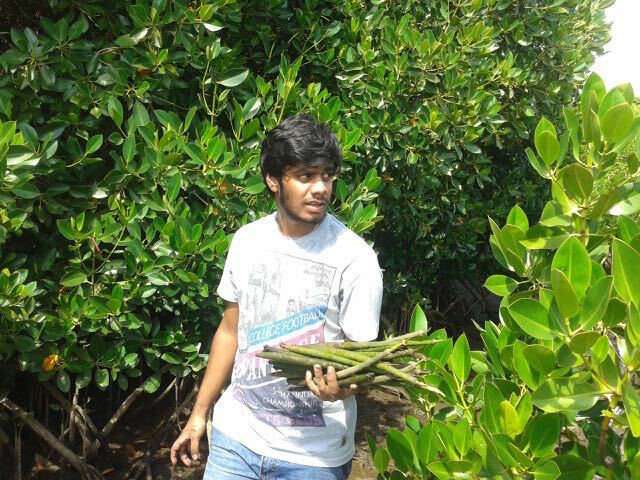 Since the land was marshy, it was quite difficult for us to collect the propagules. We even got stuck one foot deep into the swamps. Still then, we managed to complete our task. At the same time, we also planted some propagules which were lying on the land. In about one hour we collected 300 propagules. We’re now impatiently waiting for tomorrow’s event where we will, together with Rogers employees and other volunteers, make a difference in our marine ecosystem.